The thoughts and hopes and prayers I have in the second half of my life. There are many things that I did not know about Austin. The coolest fact is that they host the largest urban population of bats in America. 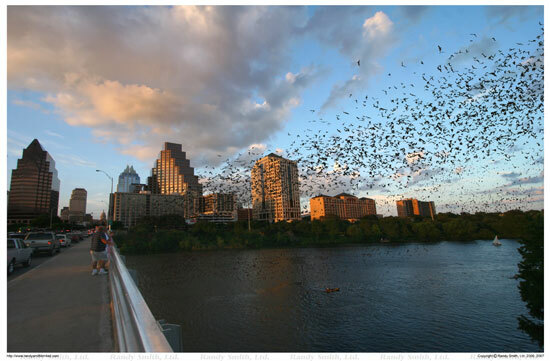 Starting now, and going through the fall, about a million bats make the Congress St. bridge their home. They migrate from Mexico, birth and raise their pups, and then take off. So the very best time to see them is in August, but even at low density times, they are impressive to watch. The bridge was renovated in 1980,creating hundreds of narrow but deep openings that are apparently just what the pregnant bat ordered in terms of hospitable accommodations. So babies are born in June and July, and are up and about by fall. At or near sunset, the bats take off in a cloud of, well, bats, to go hunting for food. I think it is a great thing for a city to embrace their bats rather than trying to find ways to discourage their return. Austin, not just for music--there is urban eco-tourism to be had there as well. Too Passionate to Be Faithful? Age 53. Mother of four boys. Married. Employed. Co-owner of three dogs. No cats, no fish, no birds. I read. I watch movies. I cook. I quilt and I embroider. I walk. I travel. I am a daughter, a sister, an aunt, a neighbor, and a friend.